Catharine started ENERGYbits after her sister was diagnosed with breast cancer and advised by her oncologist that an alkaline diet would help her heal. Catharine immediately sprung into action to help her sister research alkaline foods and in the process she discovered algae. When Catharine learned that algae was the most alkaline, plant-based, nutrient-dense food in the world and had been used for fifty years in Asia to improve health and longevity, she knew she had discovered something big that could be a game changer for the world if she could just convince people it wasn't weird. And so ENERGYbits was born (and yes, her sister fully recovered, thanks for asking). 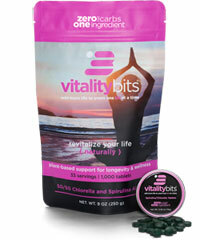 At ENERGYbits, we want it to be fast and easy for you and your family to get the nutrients you need. Our algae tablets are “bits of whole food” that are safe, pure, and nutrient-dense. 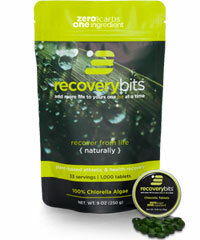 Nothing compares with the simple and safe nourishment you get from our algae. Just swallow and go. We know you want to look and feel your best. We want that for you too. 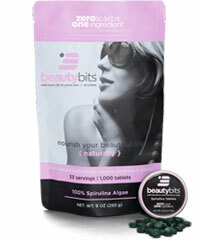 That’s why our tablets contain nothing but the best organically grown, NON-GMO algae. No fillers or binders. Nothing added and nothing subtracted. Just pure, simple, safe nutrition from real food. Our algae is grown sustainably with eco-friendly practices that respect and protect our Earth. Growing food that is good for the environment is one of our core principles. After all, Earth and algae were here billions of years before we were. We are honored to preserve their rich heritage. We are algae experts. It’s all we do. Our focused expertise allows us to provide you with the very best algae products and insights. And as new discoveries in algae agriculture or algae medicine are made, we can’t wait to share them with you. Our algae is breathing new life into the young and old. But don’t take our word for it. Read a few of our customer testimonials and you’ll be blown away by their inspiring stories. From overcoming health issues to accomplishing athletic feats, our algae is a game-changer. Find out about the kind of work we’re doing here at ENERGYbits! Spirulina algae tablets are a plant-based source of nutrition that will help keep you feeling your best. 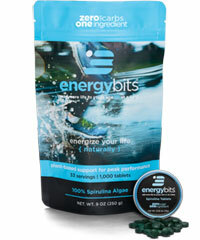 ENERGYbits® will stop your cravings, improve your focus, and give you a steady stream of energy throughout the day.